The Ravine enhancement project began in late 2017 with the decision to improve a desirable but neglected area of the park. The Ravine itself is a narrow gulley formed by a seasonal seep and winter runoff. It runs about 200′ from the upper pasture downhill to an informal amphitheater with Oregon white oaks. 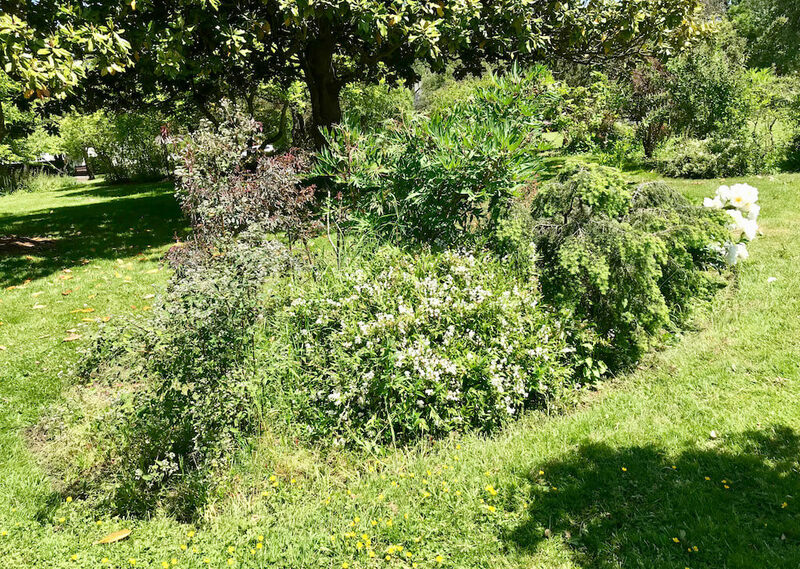 It forms a boundary line between the more cultivate areas of the park surrounding the Bush House and Barn and the more natural parts of the park. Over the years, ornamental plants have been added to the Ravine, including an impressive hedge of mature mountain laurels, several deciduous magnolias, Japanese maples, rhododendron, a bank of mixed evergreen azaleas, and deciduous Exbury azaleas. One of the Ravine’s most prominent features is a Mexican (or Montezuma) Bald Cypress that blew down in a storm and now grows almost horizontally. Its accessible trunk and branches prove irresistible to children. 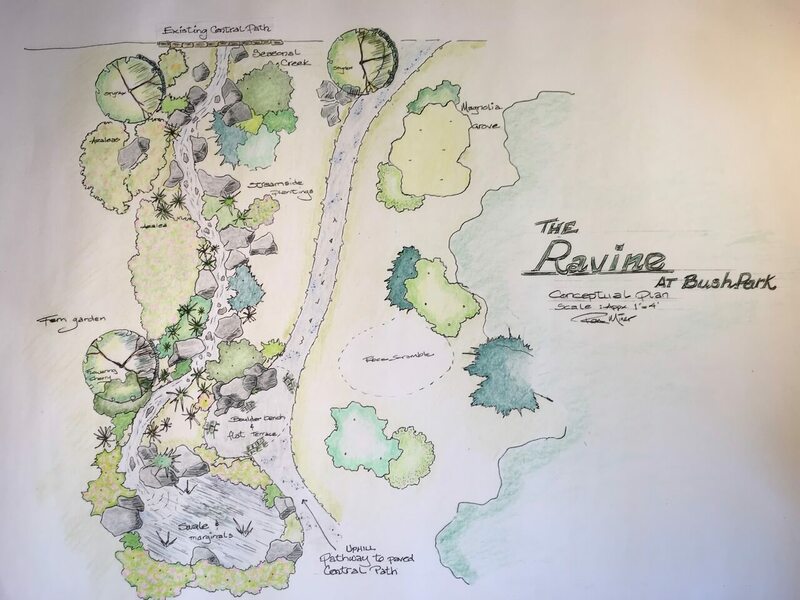 The Ravine enhancement project will slightly widen the existing stream channel, and place Willamette Valley clay boulders on its banks. The boulders will not only improve the appearance of the stream but will slow down the water and allow it to percolate into the ground. The stream will end is a large dry well backed by a berm. These improvements will help reduce the amount of water that pools to the east at the base of several Oregon white oaks each winter. A small flagstone terrace will be built near the dry well. A rock scramble for children will be installed just east of the path through the Ravine. The scramble will also create additional seating for children and parents. Once the stonework is completed, volunteers will plant a range of ground covers that will include ferns and ground orchids. They will also plant several trees, including an ‘Emerald Pagoda’ Styrax japonicus, an ‘Akebono’ flowering cherry tree, and ‘Jane Platt’ deciduous magnolia, and a Sieboldii deciduous magnolia. Ron Miner designed The Ravine enhancement with contributions and plant selection by Mission Street Parks Conservancy members and city horticulturist Tom Beatty. Willamette Valley Vineyards donated the clay boulders thanks to the help of Betty O’Brien of Elton Vineyards. MSPC’s generous donors are funding the project. The Tuesday Gardeners with install the plants and help the City of Salem maintain the area. Installation of additional Willamette Valley clay boulders along the stream’s course, complemented with a planting of flowering perennials and native ferns. Construction of a small dry well backed by a low berm to help reduce the seasonal flooding in the amphitheater. Reduction of the existing path’s width and resurfacing in order to make it better fit with the scale and aesthetics of the area. Planting of several ornamental trees, including magnolias, flowering cherry, and weeping Japanese maple. Installation of two small benches. View the project’s photo album. 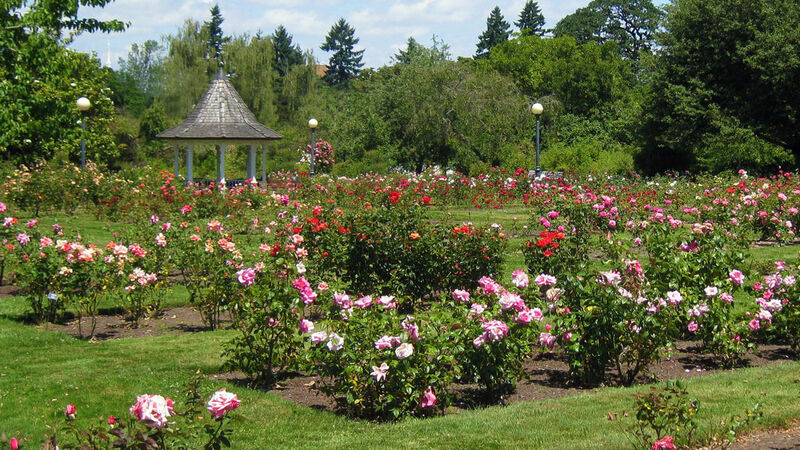 Mission Street Parks Conservancy (then Friends of Bush Gardens) and the City of Salem began the latest rehabilitation of the Municipal Rose Garden early in 2016 when ducks were seen swimming in several of the rose beds. Friends of Bush Gardens (FOBG) brought together Salem Parks, the Salem Rose Society, and others knowledgeable in things such as soils to address the poor drainage problem and the lack of vigor in many of the rose plants. The group decided to add 11 inches of a mixture of 70% clay loam and 30% garden compost thus raising many of the roses and to change the timing of the irrigation to avoid watering the roses too early in the morning. Friends of Bush Gardens formed the FOBG Rose Committee to made decisions as to which of the original roses should be kept, which rose beds needed to be raised, and which roses should be added to the collection. During the three year rehabilitation, the Committee raised 48 beds (60% of the Hybrid Tea/Floribunda rose beds), dug up, divided, and replanted 23 beds of old roses, and purchased over 650 new roses. Corrections Crews did most of the heavy work while FOBG volunteers and head gardener, Tom Beatty, moved and installed most of the roses and oversaw the edging of all the beds. FOBG and the City shared the cost of the new roses. Following the improvements to the Hybrid Tea & Floribunda garden, The City and MSPC are turning to a rehabilitation of the historic brickwork that encircles and defines the focal point of the Old Rose Collection. This project calls for the removal of the existing bricks, installation of a concrete base, then reinstallation of the bricks in the exact pattern in which they were originally installed. The northwest corner of Bush’s Pasture Park has more than three dozen discrete landscape beds of varying sizes and perhaps as many tree circles. Many of the landscape beds have been neglected for the past several years. (City staff have recently worked to clean and mulch the existing tree circles.) Now, the Conservancy and its corps of Tuesday Gardeners are working to rehabilitate the beds under the supervision of the City’s horticulturist. Since there has been no previous effort to map or document the landscape beds, the first step is simply to locate, name, photograph, and inventory them. Some of beds date back to the days of Miss Sally Bush in the early 20th Century while others were installed in the past 10 years. When the initial inventory is done, MSPC’s Tuesday gardeners will edge and weed the beds, prune the ornamental trees and shrubs, and install wood chip mulch. In late fall 2018, some beds will receive additional shrubs, perennials, ground cover plants, and bulbs. Some beds and their plant material may, with approval from the City, be removed and replaced with turf in order to improve circulation and sight lines as well as to reduce overall maintenance needs. In the past, visitors could experience the park yet be unaware of the historic significance of its unique features. To address this problem, FOBG led a project to design and install six interpretative signs at strategic points throughout the park, which now ‘bring to life’ the evolution of the natural and cultural history of the park. 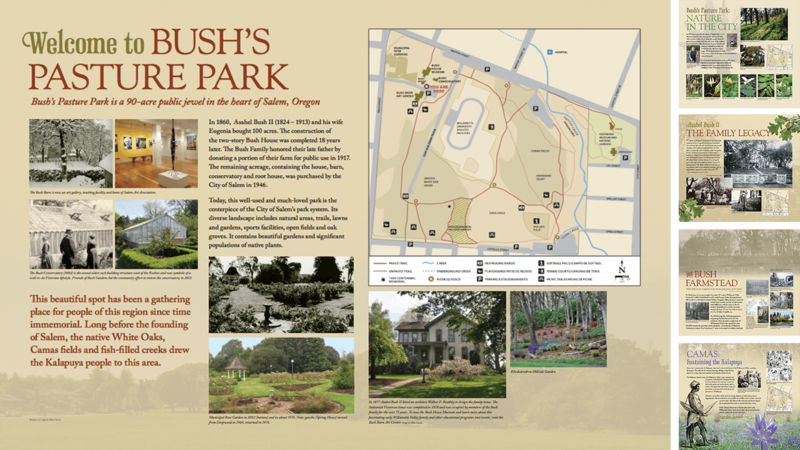 As part of the project, FOBG produced a new map and guide to the park. The project’s final phase is the addition of QR codes to each sign. QR codes will allow park visitors to access significantly more information than the interpretive signs can contain. This project is the culmination of a partnership between Friends of Bush Gardens and the City of Salem Parks with the support of grants from City of Salem’s Transient Occupancy Tax, The Oregon Park Foundation, the local Christian Science Church, and contributions from our greater community. It is our hope that the addition of this interpretive overlay will enhance your experience of this unique landscape and bring an increased ‘sense of place’ to the fabric of Salem. Oregon white oaks (Quercus garryana) are the iconic tree of the Willamette Valley and Bush’s Pasture Park. The park features hundreds of these magnificent oaks distributed throughout the park, but most are grouped in an upper (west) and lower (east) woodland. Some of the white oaks clearly pre-date the arrival of Europeans in Oregon while others were planted just last year. Trees do not always thrive in the artificial environment of parks, and that is the case of the Bush Pasture Park’s white oaks as well. Management practices such as leaf removal and summer irrigation create an abnormal environment for the trees while regular human activity such as walking and running compact the soil. 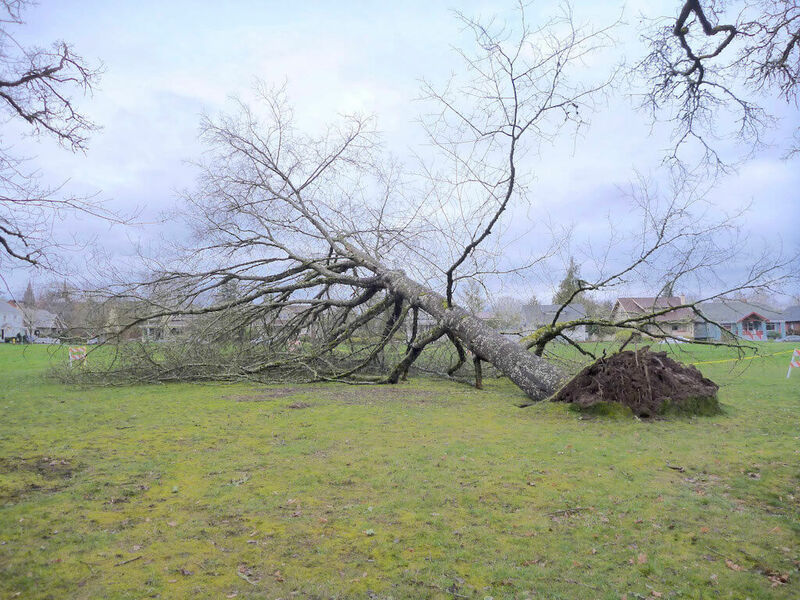 The City of Salem has agreed to develop a management plan to guide its care of the park’s white oaks in response to concerns raised by the Conservancy, neighbors, and park-goers. To contribute to that management plan, MSPC has commissioned several consulting arborists to undertake a study of the park’s white oaks. Recommendations for treatment and care. Built in 1882, the Bush Conservatory is the oldest in the Pacific Northwest and second oldest west of the Rockies (with the oldest being the Golden Gate Park Conservatory in San Francisco). Asahel Bush II built it for his daughters, Sally and Eugenia. Sally was hostess for his father’s guests, and she frequently used flowers from the conservatory in arrangements for her table and her father’s bank. Sally also ‘grew on’ vegetable starts in the conservatory for her garden, as well as mushrooms under the benches. The Bush Conservatory has undergone several rehabilitations. In the early 1930s, the family installed a Moninger Iron Frame and Truss House on the original ‘single-wythe’ brick walls, added a boiler room to the northeast, replaced the wood stove with an oil-fired burner circulating hot water through newly installed registers. In 1977-78 members of the public organized to save the conservatory from demolition. 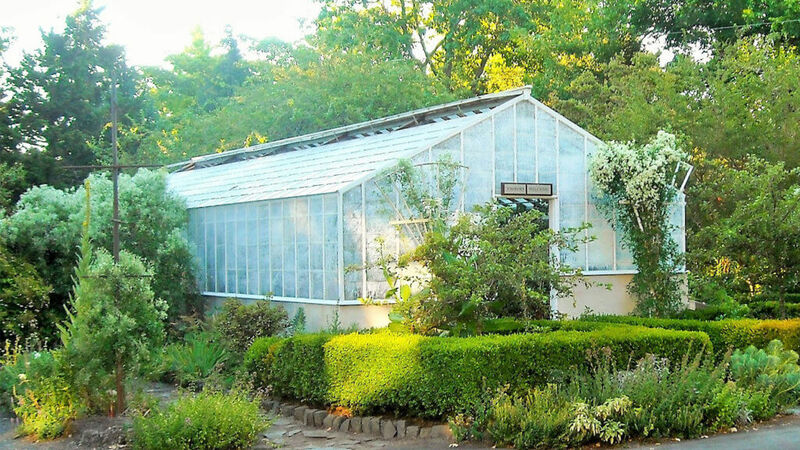 Once volunteers repaired the superstructure and replaced broken glass and all the wooden benches, Salem Art Association put out the call for volunteer gardeners to maintain the interior of the structure. This was the beginning of the Bush Conservatory Gardeners, which in 1991 became Friends of Bush Gardens (FOBG). In 2008, FOBG began a capital campaign to raise $220,000 for a proper restoration of the conservatory in partnership with Salem City Parks. They completed total restoration of the conservatory in 2011. Today, Mission Street Parks Conservancy maintains the plant collection, which represents plants common in conservatories during the Victorian period. In 1968, several years after the installation of the Municipal Rose Garden, Alice Brown Powell gifted the City of Salem with the Deepwood Spring House to place at the focal point of the rose garden. In 1978, once Deepwood was saved and the Friends of Deepwood formed, the City returned the gazebo to its historic site. At that point, the City invited a Scout Troop to build a ‘pergola’ on the site. Their design consisted of a half-circle of elevated planks on posts, planted with vines, and enclosing a brick hexagonal surface containing a large bench. Rot eventually overtook the structure, and the City invited FOBG to build a proper gazebo for the rose garden. With financial support from the Salem community and TOT funds, FOBG hired an architect who designed a gazebo inspired by the architecture of Bush House. FOBG oversaw the building of the current structure, which is consistent with the Victorian style rose garden. 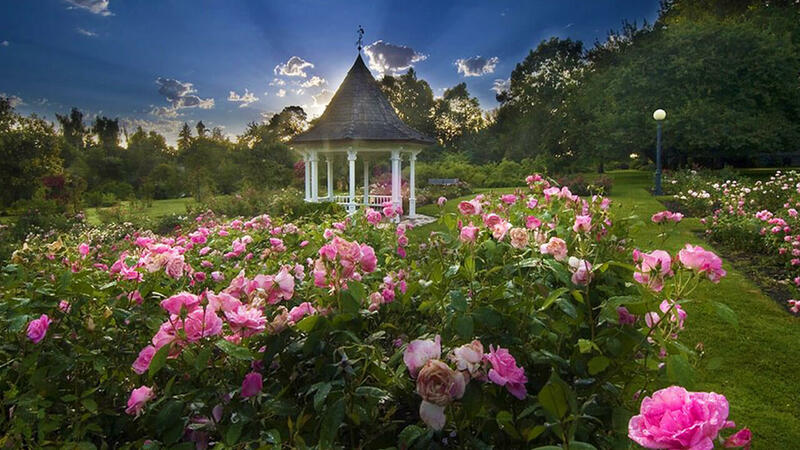 The gazebo is the site of many weddings, frequent solo musicians sending their melodies out over the roses, and anyone seeking a quiet spot to catch the breezes and ‘gaze about’.